After we had to cancel our trip to Cuba at Easter due to the Zika outbreak and a certain addition to the family come November I was desperate to book somewhere else and I knew it had to be hassle-free. Roll in the possible baby-moon destinations, after being adamant that long-haul wasn’t for us (Zika ruled out most destinations anyway) I started to look at the best adult only hotels in Europe figuring this would be our last holiday of this type for quite a while. I scoured websites, reviews and articles for days until I eventually settled upon one hotel in particular, Lani’s Suites De Luxe. Infinity pool, right on the beach, dreamy all white interiors and adults-only. I was sold. Except it was in Lanzarote. I was a little bit sceptical about visiting mostly because of horror stories of friends going on package holidays deals to resorts full of English holiday-makers. I don’t mean to come across as a snob but that’s not really my sort of trip even when going to to typical holiday destinations I tend to seek out the quieter resorts with less people or shun that style all together. This time we would be right in the thick of it in the resort of Puerto del Carmen on Lanzarote’s south coast. However upon arriving in Lanzarote my worries soon began to slip away as we breezed through the quickest passport control and luggage collection I have ever seen. Our pre-booked transfer was waiting for us and took us the short 25 minute drive to the resort and hotel. Check-in at Lani’s was quick and easy or it should have been except the other half had been so bothered about me getting out of the car safely he had left his hand-baggage in the car. Lani’s quickly showed their amazing customer service skills and rang the company for us, telling us to get settled, go for dinner and they would sort it. Being the natural worrier I was convinced the bag wouldn’t turn up, it did after all have in it an impressive amount of gadgets and travel related paraphernalia. 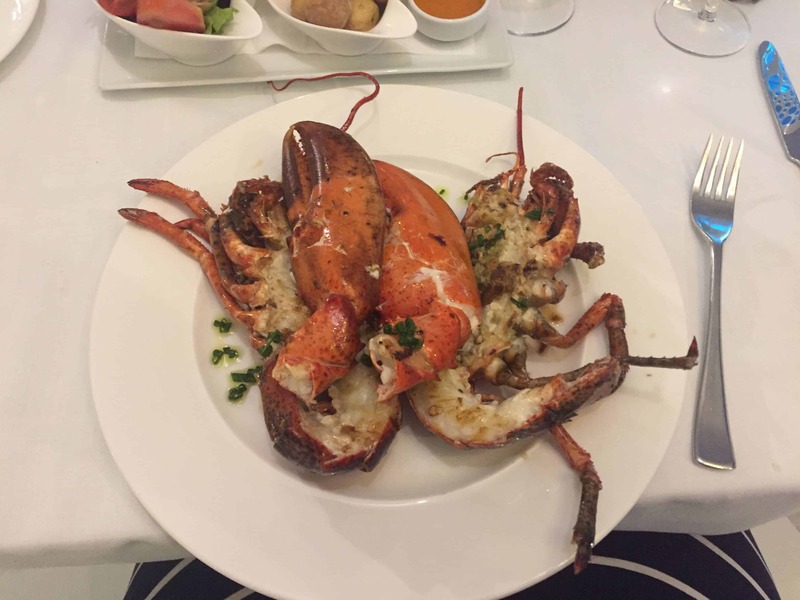 Regardless we sat down to dinner in the hotel restaurant and after throwing all caution to the wind and deciding to just let it go we both ordered a fresh lobster each when all of a sudden our transfer driver waltzed in and right up to our table bag in hand! I was amazed, shocked, surprised, relieved and hugged the poor man who had drove all the way back from his home to bring the bag back to us. The surprises were to keep on coming. 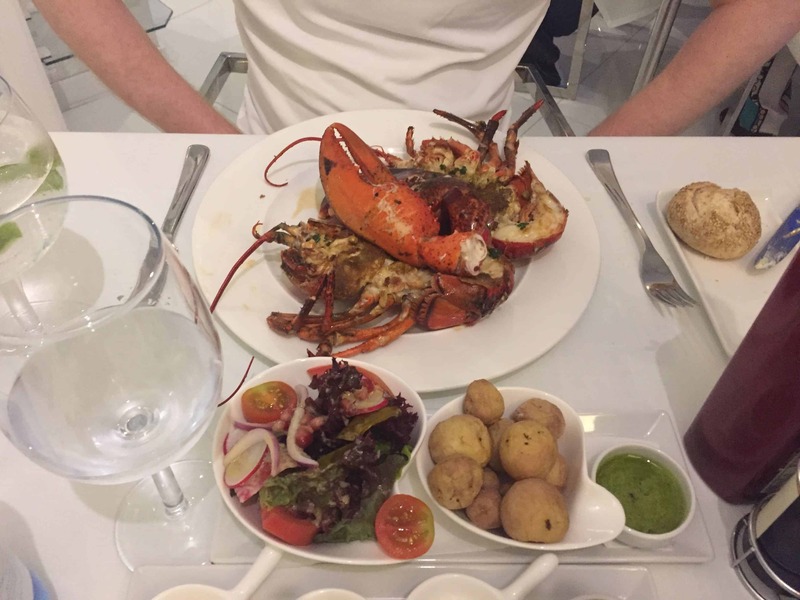 Our first meal in Lanzarote was just a taste of things to come and the lobster at Lani’s was incredible. Lobster is my favourite seafood and it didn’t disappoint. Served with simple sides of salad and new potatoes it was the perfect start to our baby-moon. I should have known after this meal to make taking my camera out to dinner a priority as when we ventured outside the hotel all the dinners we had were equally as impressive and I am kicking myself now for being a bad blogger and only having my iPhone on me so apologies for the poor quality of images. 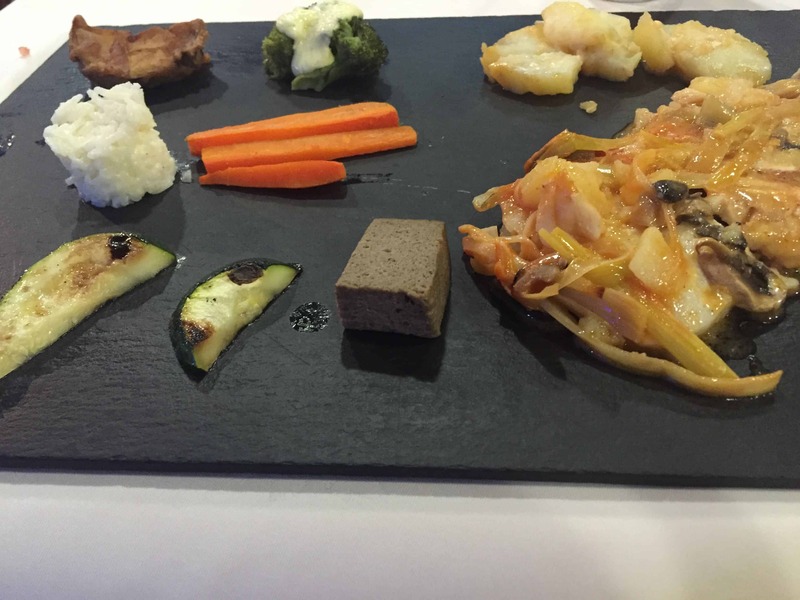 I have to tell you about the other restaurants in Puerto Del Carmen as this for me was the biggest surprise of them all. After walking up and down ‘the strip’ outside Lani’s you would be forgiven for thinking that there wouldn’t be any culinary delights to choose from but you would be judging a book by its cover. 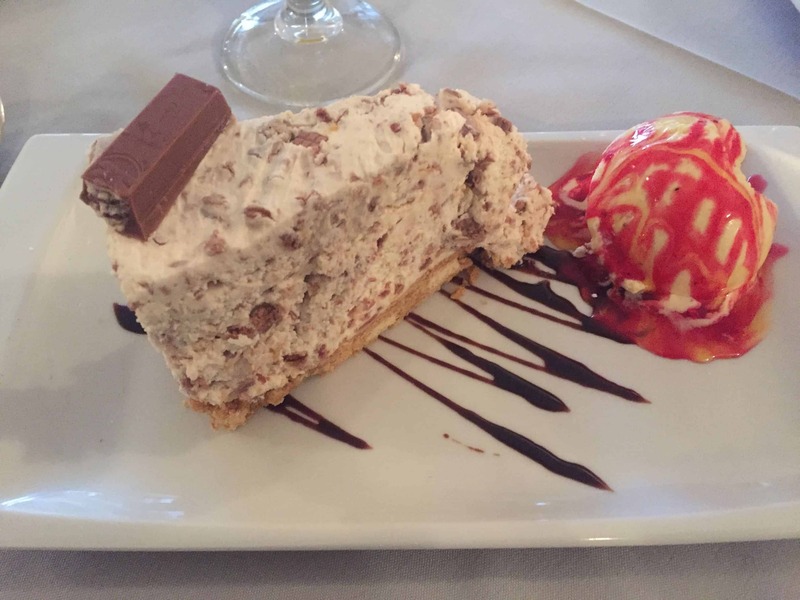 For if you search carefully on Tripadvisor you will find a whole host of amazing restaurants that don’t just serve all you can eat Chinese buffet or egg, chips and ham (if that’s what you want you can get these too!) and we headed to the first recommendation on our second night. 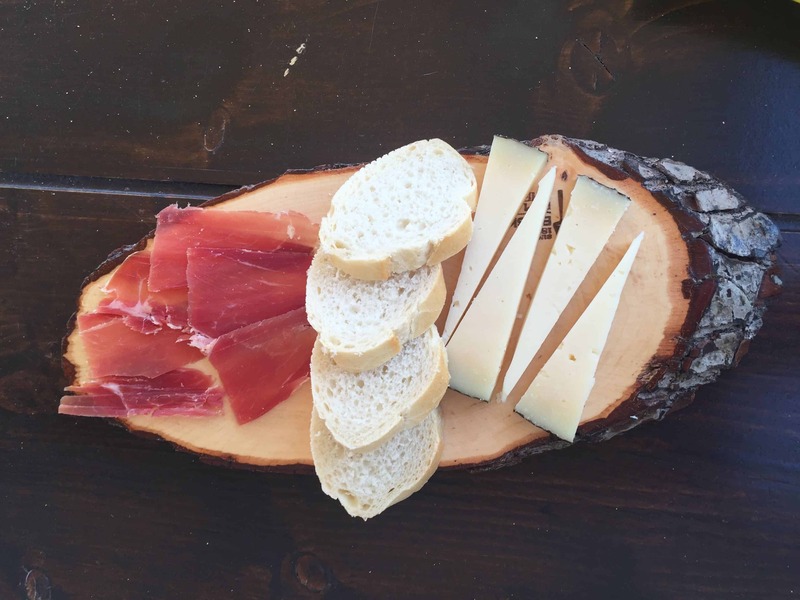 The Little Elm is a small British owned restaurant set slightly off the main strip of Avda de Las Playas, we were very lucky to get seated without a reservation as there are only about 10 tables so I would definitely recommend booking in advance. And you will want to believe me as yes the food here is great, but the desserts are something else! When I sat down the table next to me all took delivery of large pieces of cheesecake and this sealed the deal, I would forgo a starter and just have a main and dessert. So one very tasty (well-done) steak with peppercorn sauce later and this baby was all mine to enjoy. We actually ate here a second night as we enjoyed the food that much, and yes I did have cheesecake again. It was glorious and the fact I didn’t have to waddle too far back to the hotel helped a great deal! We had a couple of other great restaurants within waddling distance. Italian and pizzeria ‘La Lanterna’ was a great find with fresh, homemade pasta and a good selection of affordable dishes. 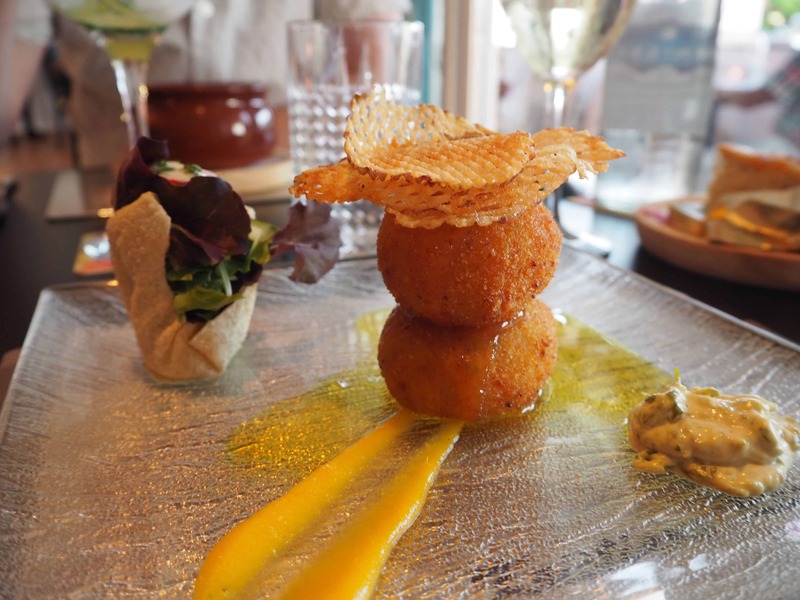 Other upmarket favourites included the restaurant at Lani’s which we had already sampled on the first night but decided to stay in-house another night due to the sheer amazingness of the location, quality of food and service. Las Vegas was the next nearest restaurant with great reviews and we were met with modern presentation and beautifully cooked dishes, my sea-bass was perfect and again the combination of fresh seafood, prepared without fuss and served with simple side-dishes made for a great light evening meal. 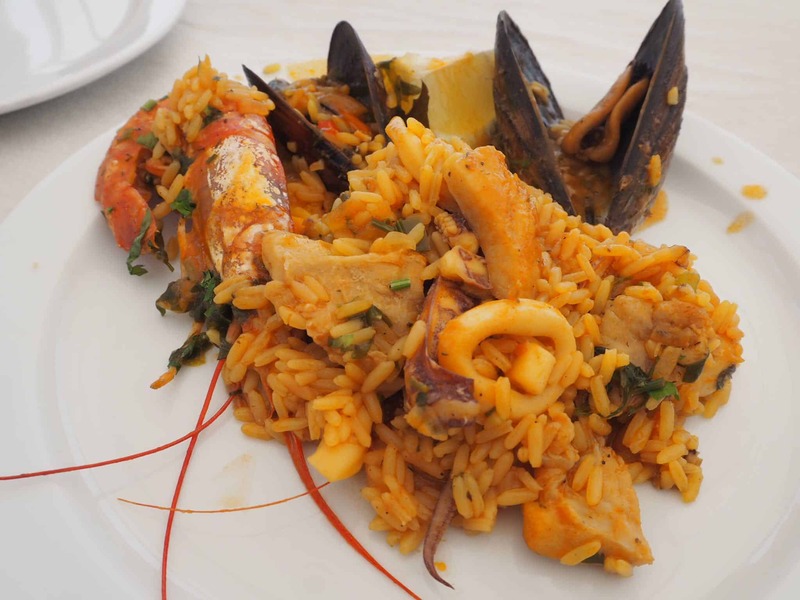 It’s also fair to point out that despite being so close to many other restaurants we only ventured outside the hotel once for Lunch and that was to next-door neighbour Terraza Playa to sample their Paella. After eating the best Paella of our lives in Ibiza this was a worthy competitor but had to be awarded the silver medal as it just didn’t quite tip the Ibizan paella off the top spot. My favourite meal of the holiday came from a restaurant that we had to make more of an effort to get to. We could have walked but a taxi for the hormonal pregnant lady seemed like a better option and with a rank right outside Lani’s it was an easy trip to the other side of Puerto Del Carmen and the area known as the Old Town. 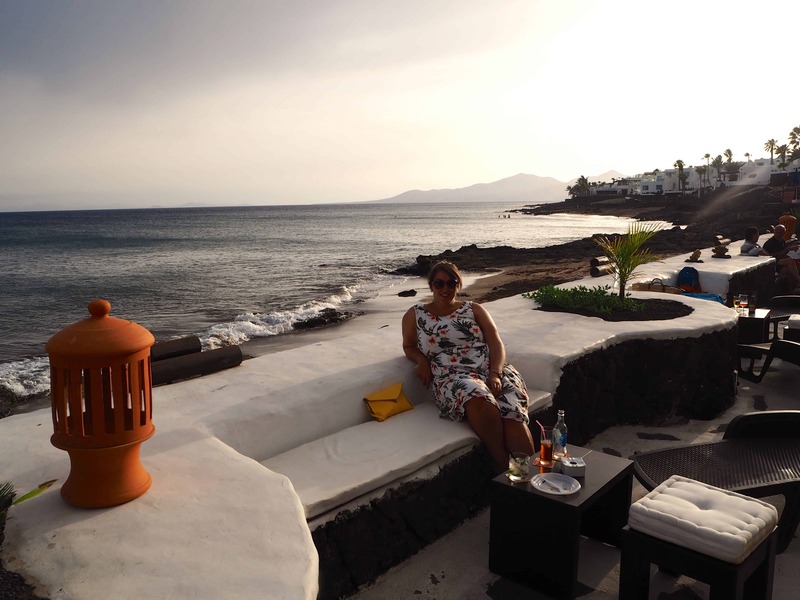 After a few drinks overlooking the harbour we headed to our reservation at Kristian’s and I was surprised by Lanzarote again to be told that they had non-alcoholic wine! Result! Wine, starter and mains ordered we quickly fell into food coma’s when presented with the most glorious dishes. My starter of fishcakes was divine and the addition of mini appetisers before the starter was a lovely touch too. I had a deconstructed chicken kiev for main which was so good I forgot to photograph and the other half was as equally impressed with his choice of duck for main and orange and carrot soup to start. This post makes it sound like all we did all week was eat and sunbathe and to be truthful that’s pretty much what we did and all we wanted to do. I purposefully didn’t book any trips and just wanted to enjoy the luxurious surroundings of the hotel, drink non-alcoholic cocktails, swim, eat and occasionally read. And that’s what we did. When the surroundings are this nice why not? I will be writing a separate post about Lani’s so look out for that as it’s the perfect place to relax and feel looked after. We did leave the hotel to have a walk on an evening and found the Puerto Del Carmen resort to be a really great location for young families, couples and holiday-makers who weren’t into a party scene. Maybe it was there if you went looking for it but we managed to find a couple of quieter bars to retreat to and enjoyed our evenings at Ancla Bar 2 which was previously the Vanilla Bar (check Tripadvisor for location) as it had a brilliant view, cheap drinks and even provided small tapas plates to graze on! The whole week surprised me, the hotel surpassed expectations, great food, beautiful location, perfect service and the fact that I was treated like royalty all week in addition to copious offers of non-alcoholic drinks made me feel really relaxed. 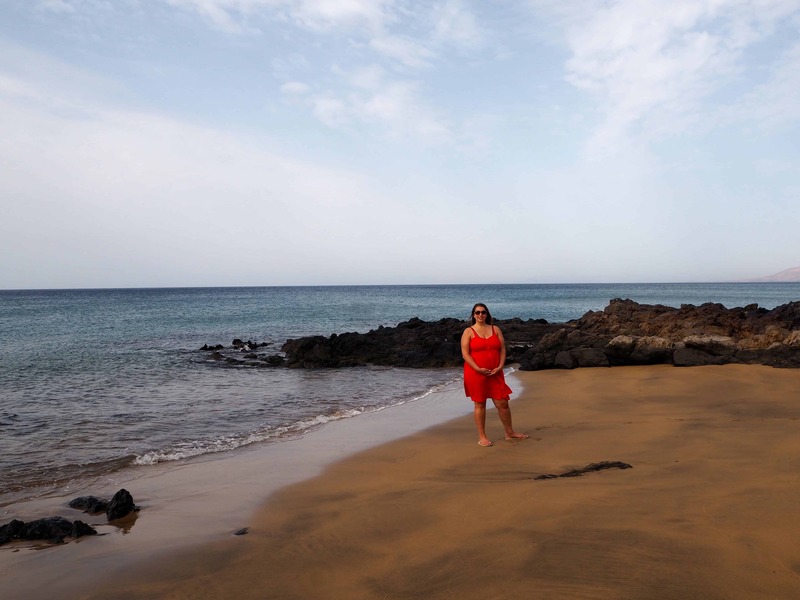 Lanzarote was the perfect escape for our baby-moon but I wouldn’t hesitate in recommending the hotel and the resort of Puerto Del Carmen for anyone looking for an easy sunshine getaway. I am sure there is lots to do on the island if you wanted to, we have already noted several dive centres for future visits and the day-trips to the National Parks looked great but this trip for us was all about relaxing before our big arrival so we just took the time to enjoy it while it lasts! Have you been to Lanzarote before? Were you surprised like I was? Which destinations surpassed your expectations?